Now you will have seven of these in a row. There will be seven per section. So it's important to know that they come one after another. The next question type will be sentence equivalence. There will be four of these per section. These are actually very similar to text completions in that there is a sentence with a blank, but here there's always one blank and one sentence But two possible answer choices or words that fit into that blank. Again, you will have four of these in a row. They don't actually come right after the text completions though. Next, it's a goold old reading comprehension. That's what everyone thinks that when they think of verbal standardized tests or at least the verbal section on standardized tests. So there it is, 9 per section. So quite a lot of the verbal section will be reading comprehension. These are not necessarily nine in a row. They will be broken up. Maybe you'll get a passage that will be four of those, four questions that is, and then there'll be four sentence equivalence questions, etc. Of course, the best idea to really get a feel of what a verbal section looks like is to take a mock test. There is one offered in the GRE Official Guide, actually there's a couple offered. And they're also offered in the software called the PowerPrep 2 software. Finally, there's the paragraph arguement. And there are about two of these per section. Now you'll notice that wait a second-- Chris didn't do his math. Eleven, nine, and two that's 22. What's going on? Well, the thing is, paragraph arguments are contained in the Reading Comprehension section. So the GRE actually hasn't given a specific name for these questions. Don't even give a specific name to these questions types but we do 'cause they are different from your average reading comprehension questions. And oftentimes they are very difficult, so it's good to have a separate section on our lesson page we have lessons that are specific to paragraph arguments. Now one little thing I wanna talk about here is this built-in difficulty in text completions. 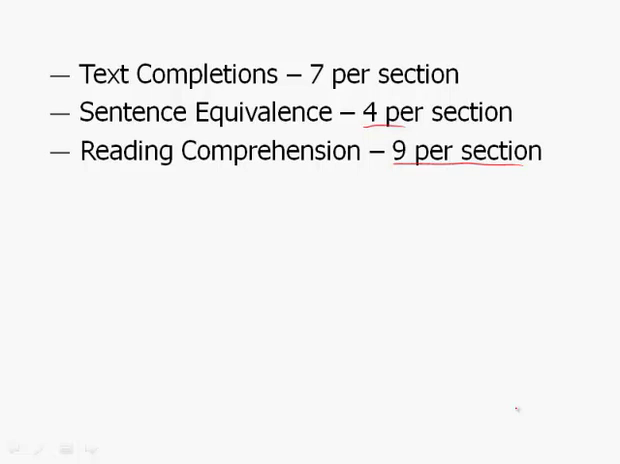 Now in general, the verbal section does not become more difficult the higher up you go, meaning that question two is not more difficult than question one or the second question reading comp passage isn't more difficult than the first one, except for maybe text completions, and let me tell you what I mean by this. Well, first off these one-blank questions. There will be two question types. Typically, the second question is more difficult in the one-blank text completions. Next you're gonna get two or maybe three two-blank text completions. The first one won't be as difficult as the second one, and if there's a third one, it will tend to be more difficult. And the reason I'm mentioning all this is from a strategic stand point. When you get to this third on and it's very difficult, that's because it is very difficult. And you do not get extra points again for that question. So it's a good idea to skip these questions and come back to them if you have enough time. It's definitely a good idea not to spendan inordinate or an excessive amount of time trying to grapple with these difficult questions. Finally there is the three blank text completion, saying you can get either a two or three of these, and the last one, whether it's number two or number three, tends to be the most difficult. So again, don't struggle with that really difficult one but go on to the Reading Comprehension, and try to find some easier medium level questions there.